Join my mailing list to get your free bonus book today! Many things can go wrong when you’re apprenticed to an absent-minded, sometimes crotchety wizard, and all you really want to do is learn a few new spells! 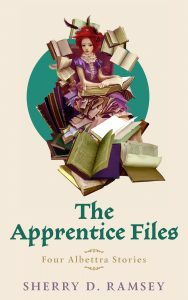 Follow Albettra as she faces magebattles, murder, suspicious disappearances, and a halfhigh stalker in this light-hearted collection of four short fantasy stories. This ebook includes: “Little Things,” “The Halfhigh Vexation,” “Summer of the Widows,” and “Nissio Lost.” If you’ve already read some or all of these stories, sign up, then contact me about other free fiction you might choose instead. My newsletter will land in your mailbox once a month with news, updates, book recommendations, freebies, and other fun stuff. I promise not to share your information or ever send more than one or two emails a month! This was a thumping good read. What made it especially good for me was to have it written by a lady author who gave it a very insightful female slant and thus, in my opinion, enriched the whole story from what could have been just have been another run-of-the mill space opera into a different realm entirely.